Duck Hunt homebrew gets an update after 3 years! Home / News / Duck Hunt homebrew gets an update after 3 years! We all remember back in the day, when we got our Nintendo Entertainment System for Christmas (I know, I’m showing my age), firing up Super Mario Bros. and Duck Hunt. Pulling out the “Zapper” and taking down those ducks. Well, when you missed you had that stupid dog laughing at you. How a dog has the ability to laugh always escaped me but none the less we all wanted to shoot the dog at one point but I digress. If you miss those old days or if it’s a new adventure for you, sit back, relax and give this a shot, pun intended of course! You can now play this on your CFW PSP or eCFW PSVita, but with new and exciting twists since the PSP version has different game modes and different shooting ways. 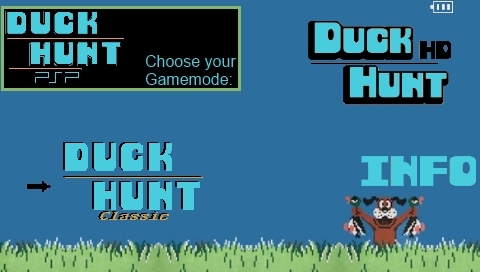 The “HD” mode in the game has been inspired by the rumor of a new Duck Hunt remake for the Nintendo Wii. It was rumored that Hudson Soft was working on it but soon it was noted as a fake report. This inspiration about a HD remake took form and it was integrated in the 1.2 update. So after 3 years, there has been a update to this Homebrew game with an entirely new game mode added in. Previous Retro Review! Sword of Mana! An overlooked gem! Next Dragonball XENOVERSE: “Resurrection of F” Costume Pack for free!